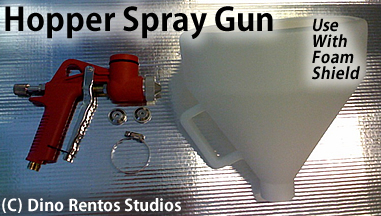 Pneumatic Hopper Spray Gun for Foam Coating - 1 Gallon - Dino Rentos Studios, INC. This spray gun plugs into your compressor. Has a 1 gallon capacity holder. 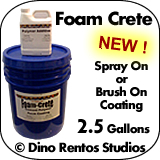 Use with the Dino Rentos Studios Foam Shield to spray an even, clean foam coating on your foam art. Gives professionial results. We use this here at Dino Rentos Studios.